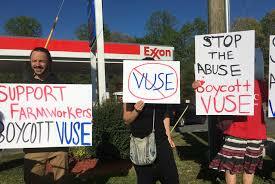 PETITION: Until Reynolds Signs an Agreement with FLOC, Drop Vuse! For ten years, FLOC has been challenging Reynolds American to work with FLOC to end abuses and human rights violations in their tobacco supply chain by guaranteeing a process that would protect freedom of association on their contract farms. 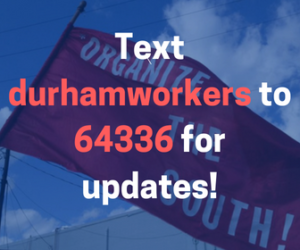 After five years of refusing to meet, Reynolds began meeting with FLOC in 2012, but these talks have not led to an actual mechanism that would allow farmworkers a voice on the job and the ability to negotiate better working conditions. Last year, FLOC members voted to boycott VUSE, an e-cigarette brand made by Reynolds, until Reynolds signs an agreement with FLOC that guarantees farmworkers freedom of association. We need you to stand with farmworkers by boycotting VUSE and demanding that convenience stores stop selling this product until Reynolds agrees to give farmworkers a voice and a practical mechanism that they can use to negotiate better working and living conditions without fear of retaliation!